Eight-year-old Labrador Retriever Terfel was diagnosed with cataracts, a common eye condition that caused the lenses in his eyes to cloud over and become opaque. As his cataracts continued to worsen, Terfel became hesitant, reserved, choosing to spend most of his time curled up in his doggie basket rather than venture out into a once-friendly world that had suddenly become so unfamiliar and frightening. Terfel’s outlook on life changed drastically the day that his owner, Judy Godfrey-Brown of Holyhead, North Wales, took in a small stray cat. Godfrey-Brown could hardly believe her eyes as she watched the little cat gently lead Terfel around the garden. 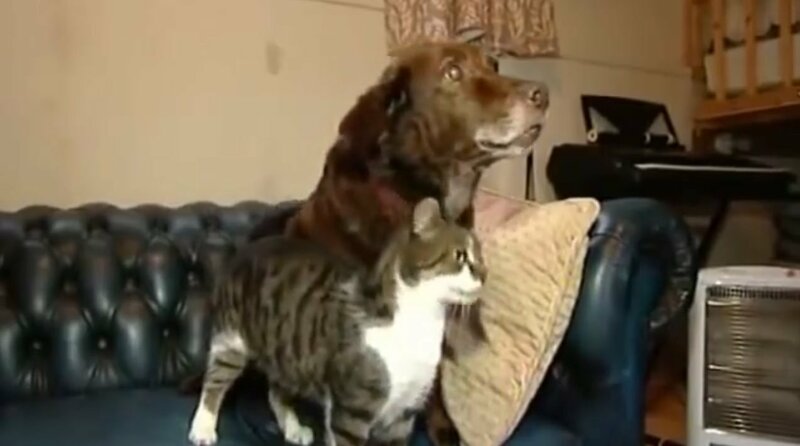 It was as if the cat sensed Terfel’s condition and knew instinctively that the blind pup needed a friend.